4 FREE Lindsay Product coupons! 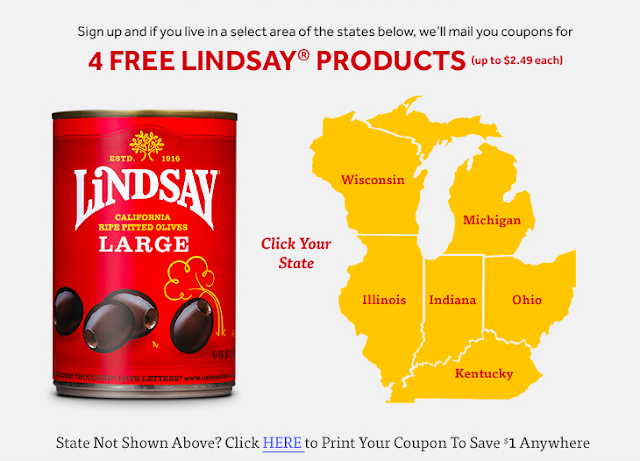 If you live in one of the select Illinois, Indiana, Kentucky, Michigan, Ohio or Wisconsin cities you can get 4 Free Full Size Lindsay Olives Product coupons - up to $2.49 each! Click your state and complete the sign up form on the linked page. Your free Lindsay olive product coupons will be mailed to you! Click the above picture to get started!